Former IBF 154-pound Ishe Smith had a swift response to southpaw title challenger Erickson Lubin, who expressed his desire to be “the first person to actually stop” Smith “or knock him out” during a recent interview with Ryan Burton of BoxingScene.com. “Funny how the first time [Lubin] stepped up, he got parked [knocked out,] ] now he’s stopping me? LMAO “They all say that. Let him dream,” ,” stated Smith in a text to BoxingScene.com. The 40-year-old Smith (28-10, 12 KOs) will face the 23-year-old Lubin (19-1, 14 KOs) on the February 9 undercard of a Mayweather Promotions 130-pound clash between three-division champion Abner Mares (31-3-1, 15 KOs) and left-handed WBA “super” champion Gervonta Davis (20-0, 19 KOs) live on Showtime at The Dignity Health Sports Park in Carson, California. Smith’s last two fights were unanimous and split-decision losses to once-beaten title challenger Julian Williams and twice-beaten Tony Harrison in November 2017 and May, and since then, the versatile Smith has seen Harrison dethrone Jermell Charlo as WBC champ on December 22, and Williams (26-1-1, 16 KOs) position himself for a shot at IBF/WBA titleholder Jarrett Hurd in 2019. Lubin is coming off a fourth-round TKO of Silverio Ortiz in April to rebound from a first round stoppage loss to Charlo in October 2017. “I got the win but we definitely want the bigger fights. Ishe Smith is a great name. He is real tough. He has never been stopped. I definitely want to be the first person to actually stop him or knock him out. I am definitely not going to go in there trying to stop him. I am going to do what I do and execute the game plan,” said Lubin, who is being trained by Kevin Cunningham. But Smith believes he can capitalize on a perceived fragile psyche in Lubin, who was floored by Charlo’s head-swiveling right uppercut. Lubin crashed to the canvas on his left leg, toppling over his right side, his left arm and leg flailing as the referee ended it. “With Lubin, the first time he really, really stepped up, he suffered a setback. You can say that he got caught. But he’s still never been a situation where you’re looking across the ring at another man knowing you have to dig deep,” said Smith. Smith is returning to his roots in the Dignity Health Sports Park (formerly StubHub Center), a venue whose name was changed from Home Depot Center in 2013. It was in June 2003 that the then-Home Depot Center’s initial boxing event featured Smith’s second-round stoppage of Sal Lopez along with the late two-division champion Diego Corrales’ third-round knockout of Damien Fuller. 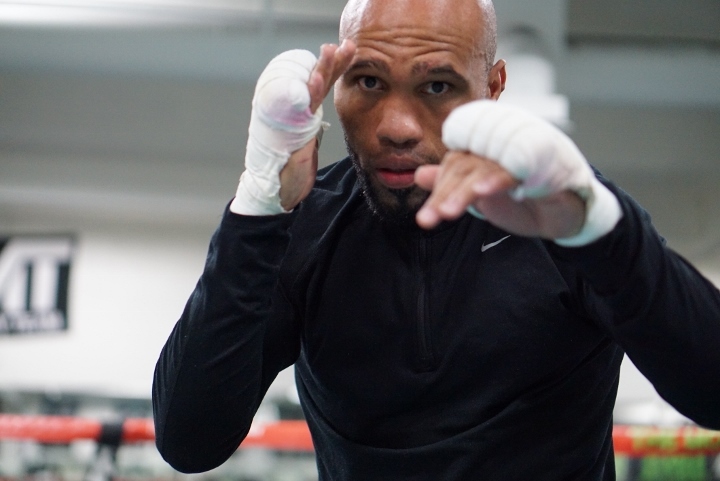 Smith has also reunited with trainer Eddie Mustafa Muhammad, who was in “Sugars Shay’s” corner for his IBF 154-pound title-winning unanimous decision that dethroned Cornelius Bundrage in February 2013 in Bundrage’s native Detroit. By defeating Bundrage, Smith became the first Las Vegas-born champion before losing the title in his very next fight to Carlos Molina (September 2013) by split decision at the MGM Grand in Las Vegas. “I came up with Hall of Famers. My first traing camp was with [southpaw] Pernell [Sweet Pea] Whitaker when he fought Felix Trinidad. I was Sweet Pea’s chief sparring partner,” said Smith.